At last, the snow has arrived! At least this has happened in many corners of Spain. Maybe because tomorrow is WORLD SNOW DAY, nature has been wise and surprised us in this way. So it is time to enjoy winter sports, take out the equipment and enjoy the adventure without limits. However, before carrying out any winter activity, the material and accessories are vital, check the risks in the winter mountain such as avalanches, embossment, recent snowfall, the orientation of the slope, vegetation, cornices, ice, hidden ibon … and enjoy the activity without any risk. We leave you some ideas to enjoy the Pyrenees. This tour is suitable for all audiences, although the environment will not leave anyone indifferent regardless of age and level. The ice waterfalls descending from the Sierra de Liena is one of the attractions to enter Valle de la Barrosa. Once past the forest – surrounded by peaks that touch and pass the 3000 meters – you reach the Plan de la Casa where the valley turns to the north and is when we will encounter the shelter of Barrosa. If you still want, you can continue ascending towards the port of Barrosa and the circus of Barrosa itself. Weather: 4-5 h / 360 meters in positive / Bielsa. A complete crossing of the entire valley of Estós in winter, until the end of it in the port of Chistau, requires something more than a day, but in a day is possible to reach the shelter of Estós. Bordering the cut formed by the waters we will get to the plain of the hut of Turmo, here begins the most spectacular part of the route. From the plain, we can enjoy the Pico Perdiguero and the Portillón. To reach the port of Chistau, it is advisable to stay overnight in the shelter (not saved) adding a further incentive to the experience. Weather: 5-6 h / 400 meters in positive/ Benasque. The tour of the circus of Colomers is a classic and habitual route during the summer in this zone. The mixture of rock, green and water along with peaks that touch the 3000 meters is a combination that charms anyone. In winter, of course, the number of people is significantly reduced. The environment changes face, the lakes disappear, but that does not make its landscape equal or more spectacular than in summer. Weather: 3-4 h / 200 meters in positive/ Valle de Aran. This route takes place in the area of the estanys located between the shelter of Ventosa and Cavell and Montardo. The path is surrounded by famous three thousand like Punta Alta de Comalesbienes, the Montardo, Besiberris and the peak of Comaloforno; In short, a whole recital of rock, snow, and ice thrown into the sky. 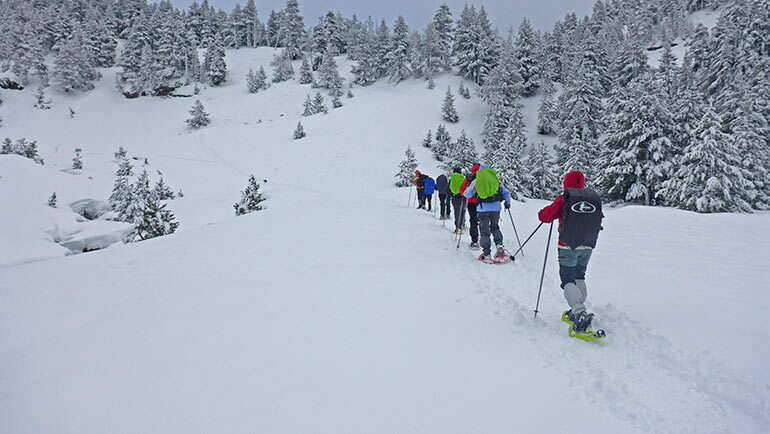 The first part of the route is the most complicated, but dangerous, although these difficulties will certainly be attenuated or increased according to the state and amount of snow. Weather: 5-6 h / 750 meters in positive/ Valle de Boí at the Ribera de Caldes. The most appropriate phrase to define this route is “no one comes here in winter” However, its situation and orientation allow to contemplate some panoramas of the whole area of Colomers and Bonaigua that cannot be done from anywhere else. The Coret de Varradós, more than a hill, is an extensive flat area that serves as a passage between Bagergue and the valley itself of Varradós. The beginning is a descent; On the way back, this place will be tough. Once in the Lana plain we will see the Lana refuge in the background, the path passes behind the shelter and is gaining altitude towards the ravine of Moredo. Weather: 4-5 h / 600 meters in positive/ Valle de Arán. Although it may seem a simple walk is the ideal crossing to advance in the handling of the rackets due to some points that require some skill but without significant complications. The valley of Remuñe and its circus, with its more enclosed zones, give way to plains delimited by wild peaks and risks. Visually you will be surprised especially when you gain a little height, Alba’s peak and the last peaks that close the massif of the Maladeta will be some of the surprises.